Over the past three weeks we have been calving. This year for the first time, the cows which were to calve have been synchronised. Synchronising the cows is when the cows are all made to come into season at the same time and therefore served (using AI – Artificial Insemination) at the same time. You would think that this would mean that they all would calve at the same time, but that did not happen. 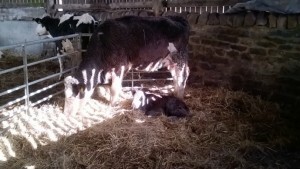 One calved a week early and the last one calved 10 days late, not one cow calved on the day she was due! We started off well – a black South Devon Cross was the first to calve and she calved easy, the calf got up and sucked straight away, and we didn’t need to do anything apart from spray its naval with iodine to prevent infections. 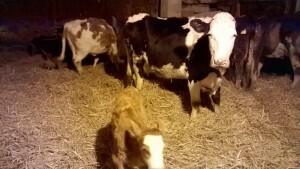 Dad said: “I hope there are all like this!” But that wasn’t the case, a week later a heifer started to calve. A heifer is a female cow that has never calved before. We had to give this heifer a bit of a helping hand and give the calf a pull with the calving aid as it was a very big calf. We were lucky to get him out alive and over the next few hours we had to give him some milk in a bottle as he had pulled himself so he could not stand. But the next day he stood up and never looked back. The next one to calve was a 2nd calver, so we thought she would be fine, but she made no progress for 3 hours so my Dad decided to have a feel inside. The cow’s cervix had not opened meaning there was no room for the calf to come out. My Dad decided to ring the vet and the next thing we knew the cow was going to have a caesarean section. The cow was very uneasy when the vet was washing her side and clipping the hair off. Within the next hour the vet had the cow’s side cut open and was trying to get the calf out. But it was a struggle as the calf was at the other side of the cow and the vet couldn’t get hold of it as she ran out of reach. But she managed to get it and the next thing we knew the calf was out and I tried to get her going and rubbed her with straw as the cow had to get sewn up. They managed to get her done even though she was very uneasy. The calf was a very lively calf and got sucking itself eventually. All the rest of the cows calved easy and now all the calves are running around the building. But we are not sure whether to synchronise them again as we were still calving over three weeks, which we would have been doing anyway even if they hadn’t been synchronised!